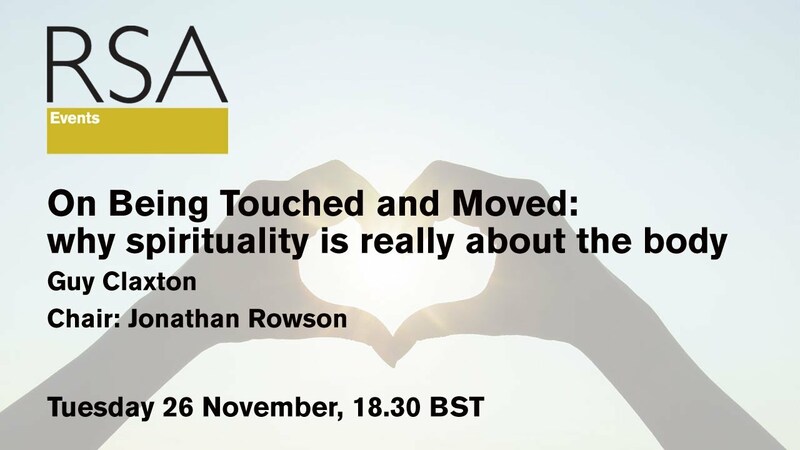 This is a cool talk from the RSA on embodiment and spirituality. Guy Claxton is a psychologist and senior lecturer at King's College, London. He is currently teaching at Schumacher College, a new international centre for studies informed by spiritual and ecological values at Dartington, Devon. He is the author of many books on religion, psychology and education, including The Heart of Buddhism: A Simple Introduction to Buddhist Practice (2013, Kindle only in U.S.), The Learning Powered School: Pioneering 21st Century Education (2011), and The Wayward Mind: An Intimate History of the Unconscious (2007). Watch this event as a RSA Replay (above). RSA Replay is now a featured playlist on our Youtube channel, it is the full recording of the event including audience Q&A. There will an edited high-res video version of the talk available in a couple of weeks time, and if you subscribe to our channel on YouTube - you'll get automatically notified whenever there's a new video. In the next in our new series of talks and debates opening up a new public conversation about spirituality in the 21st century, Professor Guy Claxton explores spirituality’s embodied nature. The “felt” experience of spirituality is described in surprisingly common terms by those who undergo it. Though accounts are clad in all kinds of cultural tropes, its essence appears to lie in a spontaneous, and usually fleeting, transformation of bodily awareness; people describe a dissolution of separateness and loss of agitation, and report feeling suffused with energy, brightness and open-hearted concern. In his lecture at the RSA, Professor Claxton shows how new insights from the science of embodied cognition can help to make sense of this perceptual shift. Spirituality as a set of practices can be seen as bound up with people's desire to recapture and stabilise these tantalising glimpses of an inherent, untarnished capacity for physical vitality, peace of mind and loving fondness for the world. Can science also help to structure this quest? Speaker: Guy Claxton, Co-Director of the Centre for Real-World Learning, and Professor of the Learning Sciences, University of Winchester.